With a very relaxed, comfortable atmosphere coupled with made to order gourmet sandwiches, fresh handmade soups and many other menu items. This is all prepared by a staff headed by our head chef who uses years of training and work in some of the finest restaurants in the country as the backdrop for contemporary flavor fusion so unique and unmistakable that once you experience it you will never forget it. I had no idea what to expect of this place, but it ended up being very good. Food: Tons of sandwich options and many look very good. I had the Montecristo and it met expectations. It was served with a pickle and pita chips. I also had a sinful bar, which was excellent. Service: The lady at the counter was very friendly and helpful. Overall it was good. One lady was a little rough around the edges, but the rest were great. Prices: The sandwiches are all around $8-$11, give or take. The sweets around $3-$5, and up. Its not a cheap lunch by any means, but the food is very good. I would definitely return. A nice option if you just want a good deli style sandwich. My order from lunch was brought wrong to me and the server who rang me would not offer to correct the mistake. This employee definitely had a blase attitude toward the restaurant she is employed by. First time I have ever had that kind of service here. This place has a ton of options. All kinds of sandwiches, wraps, soups, salads, and pastries. It's large inside and everything I've had has been fresh and high quality. I don't think there are many good places to get a decent sandwich in Green Bay, but this place does have good sandwiches. It's the perfect place for lunch or to grab something on your way home. This place should be called Sandwiches from Heaven. Their sandwiches are displayed for you and are piled high with ingredients. You will never utter the words subway or jimmy johns after just seeing these sandwiches. I like the Tommy Motts, the Rachel (instead of the Rueben), The Better BLT and the FUGHEDABOUTIT. Soups great. Cream cheese frosting shortbread cookies are great. I never know why this place isn't packed during packer games. It's right on the route and right next to a Packer shop. Maybe it's because the name says only cheesecake. Come to think of it, I've never had any of their cheesecake. Cheese Cake Heaven’s interior is open and bright with large glass cases displaying their delicious gourmet sandwiches, homemade pastas and their delectable bakery. The restaurant has a nice, comfortable and casual atmosphere. It is located in Ashwaubenon, not far from Lambeau Field on Green Bay’s west side. The left and right side of the restaurant has plenty of seating with tables and the center has a help yourself beverage station with partitions on each side. In the rear of the restaurant, high above the registers are giant chalkboards with their menu. 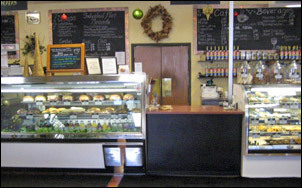 Additional laminated menus are located next to the register for perusal. Cheese Cake Heaven is also decorated with plants, different pieces of brightly painted artwork from various artists, and has a comfy seating area with leather sofas and reading material for your enjoyment. Cheese Cake Heaven has a variety of homemade soups, pastas, sandwiches, wraps, breakfast items, and build-your-own salads to choose from. Everything looked so tempting it took a fair amount of consideration to decide on creating my own salad. Orders are placed and paid for at the register. A number is then given to the customer so the order can be brought out to the appropriate table. 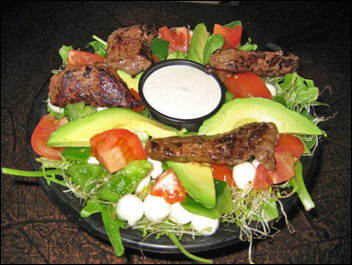 My salad consisted of fresh mixed greens, avocado, sprouts, tomatoes, green pepper, sliced steak tenderloin, fresh baby mozzarella balls, and Caesar dressing on the side for $8.99. When you create your own salad you have a choice of one type of lettuce, four toppings, one meat and one cheese. You can always add as much as you would like for an additional charge. The salad was brought out to me and it looked very appealing. It was served in a large deep bowl and was densely filled with fresh dark greens and all the ingredients were sliced into large fresh portions. The dressing paired nicely and tasted delicious on the salad. The grilled tenderloin was very tender with good flavor. I plan on visiting Cheese Cake Heaven again soon to try one their gourmet sandwiches and scrumptious desserts.